Note: Note: The station opened as Hotspur and was renamed Backworth from the timetable of June 1865. The two platforms were on a curve of 17ch radius. Until the early 1970s a bridge carrying the Backworth Waggonway (see Backworth Colliery entry) crossed the station halfway along the platforms. Set back from the up platform, the original station office building was of Tudor Gothic design (illustrated in W Fawcett A History of North Eastern Railway architecture Vol 2) similar in style to South Gosforth and Jesmond’s buildings, and it survived until about 1972.
replaced in the mid-1960s with a metal-and-glass ‘bus shelter’. Apparently, owing to an oversight, the new shelter was built lacking an entrance! In about 1885 the booking office functions had been transferred to a wooden shed on the overbridge at the north-east end of the station, which also served as the footbridge to connect the platforms. A range of windows overlooked the platforms. (A similar building appeared at Seaton Delaval.) A small extension was added to the north end of this overtrack building in the 1920s. The original building assumed the new role as the stationmaster’s house. Under LNER administration Backworth station was fitted with nameboards of a design that was probably unique to the Coast Circle stations incorporating the company’s early diamond motif: in effect a spike above and below the centre of the board, and these were in place until about 1959 when BR(NE) vitreous enamel signs replaced them. The LNER also installed swan-neck electric lamps and nameplates, and in about 1962 BR(NE) totems replaced the LNER nameplates; only six of the Coast circle stations were favoured with totems. In 1971 tall ‘vandal-proof’ lamps replaced the LNER ones, and the totem signs disappeared. Corporate identity signage was fitted in 1973, although a BR(NE) ‘Passengers must not cross the line except by the footbridge’ sign was in place on the up platform even after closure. 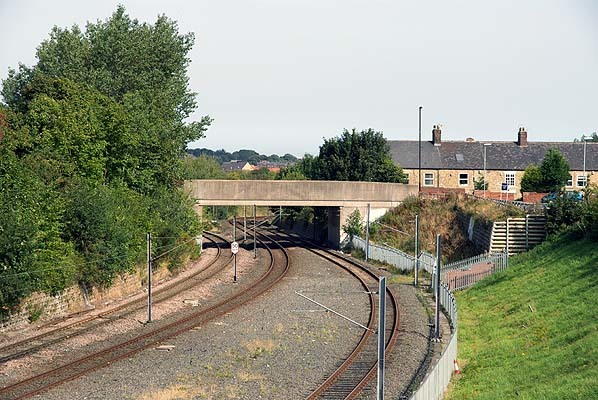 Blyth diverged, which itself was closed on 1 March 1964 when operations transferred to a new box at Benton (adjacent to the ECML). 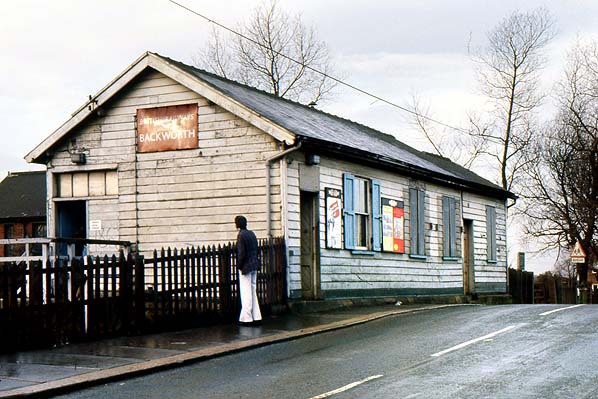 The Backworth box was demolished on 16 November 1970. 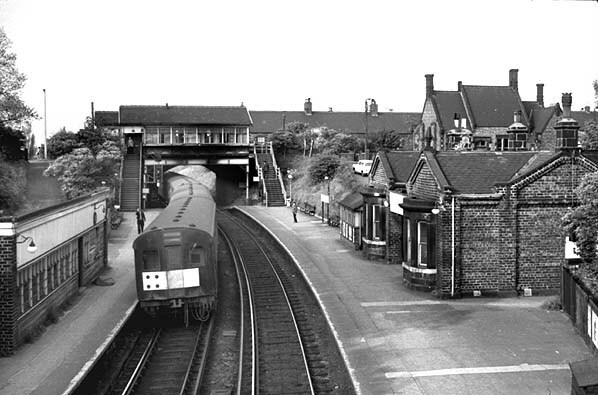 Blyth and Newbiggin trains to and from Manors North called at Backworth until their withdrawal in November 1964, allowing interchange with local Coast electric train services. Whereas most of the ‘Coast Circle’ line was through densely built-up urban areas, until the 1930s there was very little housing development between Benton and Monkseaton. In 1911 the NER noted that the station served a population of only 9,914. In the 1950s there was still little line-side housing in the Backworth area, and it was the least used station on the Coast Circle. The station closed in 1977 - almost a year before the line was closed to passengers for conversion into the Metro light rail route - and it was swiftly demolished. When the line reopened Backworth was replaced with a station half-a-mile east at Shiremoor, but in 2005 Northumberland Park station opened a short distance south-west of Backworth, beyond the Algernon Drive overbridge. extras in the rush hour. Tickets from Michael Stewart except 1535 CJ Dean. Bradshaw from Nick Catford. Totem from Richard Furness. Route map drawn by Alan Young. 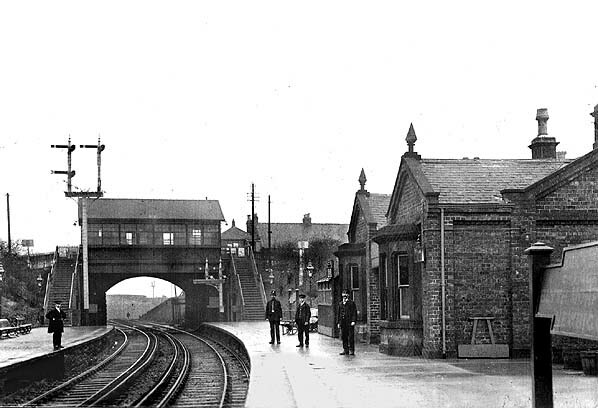 Looking north-east along the up platform at Backworth c1905. 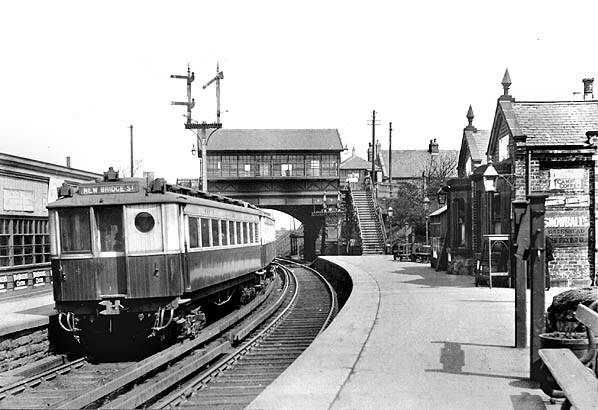 The 1904 stock electric train at the down platform has presumably come from New Bridge Street and is signalled to take the right-hand curve towards Tynemouth. The waiting shed with its range of windows and large facia is partly obscured by the train. The former booking hall is on the up platform, and the building which took over the booking function is seen spanning the tracks adjacent to the road bridge. The overtrack building, omitted from the 1897, can be seen adjacent to Station Road overbridge. The old signal box is indicated as ‘Ruin’, and its replacement is between the diverging lines in the north-east corner of the map. This view on a postcard sent in 1905 shows a new electric multiple unit standing at the down platform at Backworth. It is signalled to take the route towards Tynemouth at the junction beyond the bridge, immediately north-east of the station. Buildings can be seen on both platforms, liberally decorated with metal advertising posters as was common practice until the inter-war years. The wooden overtrack building was installed by the North Eastern Railway in 1885. St Edmund’s School is on the extreme left of the picture. Looking north-east along Backworth’s up platform c1905. The single-storey brick building on this platform with its prominent twin gables and urbane stone bays was formerly the booking office. In 1885 this function was transferred to the wooden shed slung across the tracks adjoining the road bridge. The electric third rails are in place. The two sets of signals can be seen warning of the divergence of the Blyth and Tynemouth lines immediately after the bridge. The signal box, in its original position, can be seen beyond the bridge. Looking south-west from the up platform staircase at Backworth c1910. Two electric units of 1904 stock are passing. The destination blind of the ‘up’ train reads Manors North, a reminder that at this time trains did not cover the entire ‘Coast Circle’: this one would have originated at Newcastle Central, then travelled via Tynemouth. The train at the down platform will be on a Manors North to Central via Tynemouth working. (Until 1917 only the Benton shuttle services used the 1909 link between Central and Manors North.) The waiting facilities on both platforms can be seen, whilst the booking office is in the overtrack building, out of sight behind the photographer. The variety of luggage and sack trolleys in the foreground on the up platform will be noted. The bridge in the background carries the Backworth Colliery railway (formerly Backworth Waggonway) over the Blyth & Tyne line. 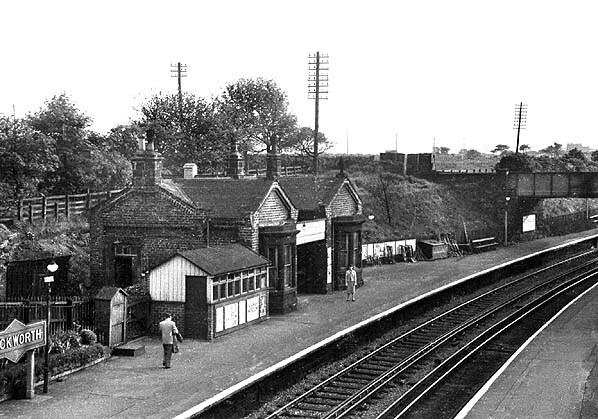 The up platform seen from the down platform staircase in 1959. On the extreme left is an LNER running-in board incorporating their early ‘diamond’ device, a feature seen only on Coast Circle stations. It would be replaced within two years with a BR(NE) sign. The ‘mint imperial’ lamps carry LNER nameplates. 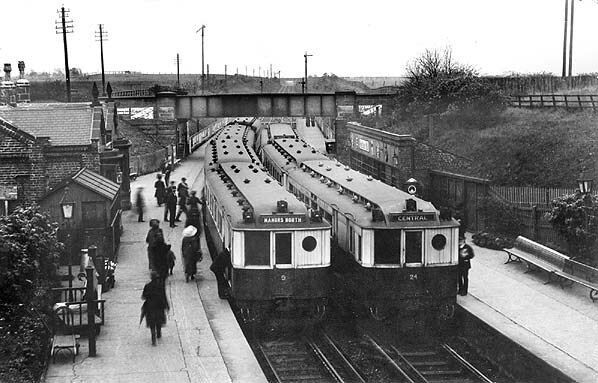 In June 1967 electric multiple units made their final appearances on the Coast Circle route; diesel multiple units, formerly confined to the Blyth and Newbiggin services, were phased in to replace them. Seen from the Backworth Waggonway bridge, a dmu is entering the up platform. In the background, to the right, and at a higher level the former stationmaster’s house and offices can be seen, set at right-angles to the platforms; this structure was in the style of the station building at South Gosforth. The former booking office, converted to waiting rooms is on the up platform, with further waiting facilities on the opposite platform. The wooden overtrack building is in use as the booking hall and footbridge. In this excellent picture from June 1967, looking north-east from the former Backworth Waggonway bridge, an electric multiple unit is leaving the down platform en route to Tynemouth and Newcastle. This was the final month of the electric services. The modest, but attractive, buildings on both platforms are clearly shown, as are the former stationmaster’s house (upper right in the background) and the overtrack building added by the NER in 1885. Station approach roads can be seen serving each platform. 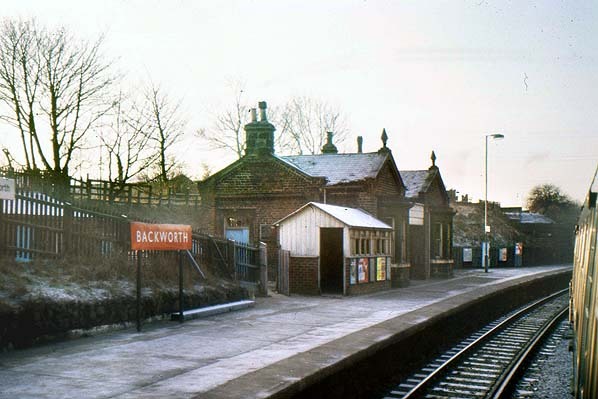 This Backworth station did not handle goods traffic, but its predecessor on the route to Seghill (renamed Holywell) continued to provide such facilities after it ceased to be a passenger station. 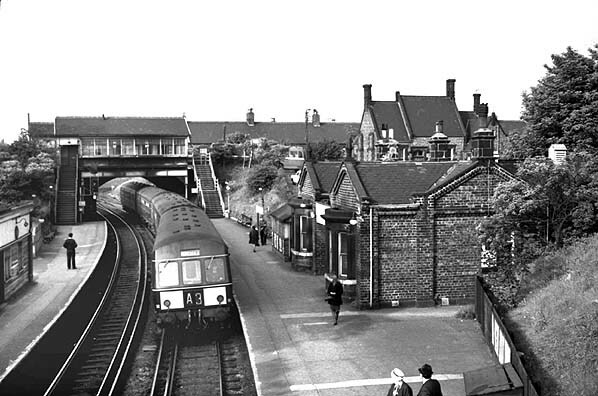 On the last day of 1973 the up platform is seen from a DMU. These units had bars fitted to the windows in the passenger doors to prevent passengers from leaning out of them (for instance, to take photographs!) as there were limited clearances and accidents were likely. The author asked permission to use the guard’s window, not fitted with bars, to take this photograph. The BR(NE) running-in board is still in place as is the increasingly vandalised waiting room block. On 27 December 1976 the wooden overtrack building, containing the footbridge and booking hall, looks distinctly shabby. BR(NE) livery is still in place, including the station name and ‘totem’ notice board headers, and faded ‘oriental blue’ paint still adorns the door and the window shutters. A few months later this structure was to be demolished. 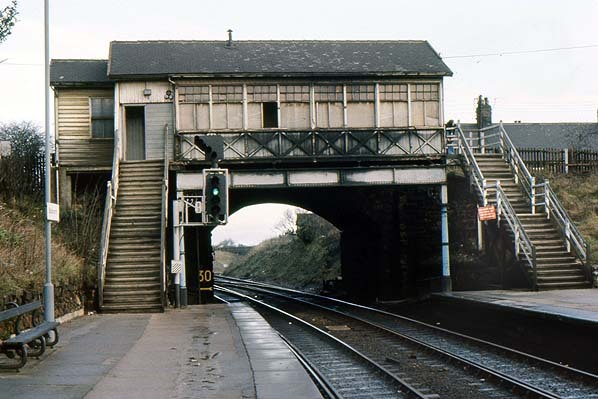 Looking north-east from the down platform in December 1976. 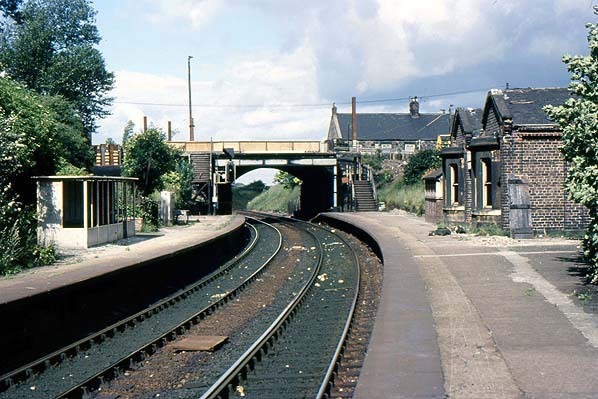 Looking north-east in July 1977, a little over a month after closure, Backworth station awaits demolition. The overtrack building has already gone. 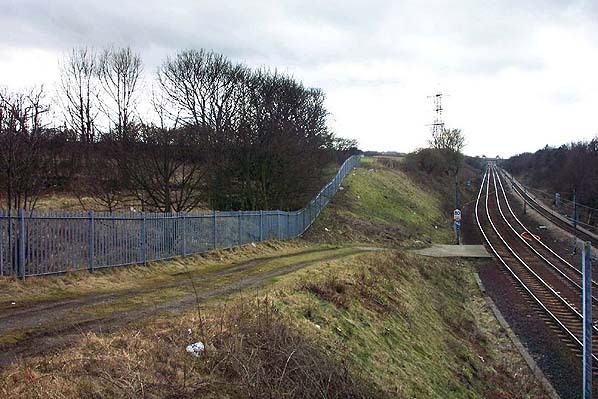 The site of Backworth station, looking south-west in March 2003. 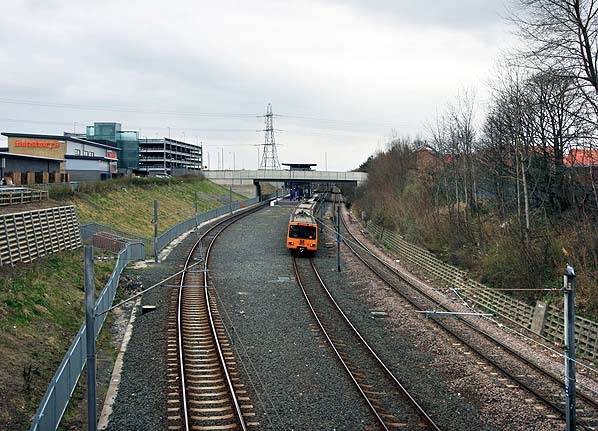 The additional track to the right is for freight workings to and from the Ashington and Lynemouth route – which diverges from the Metro tracks a short distance behind the camera. 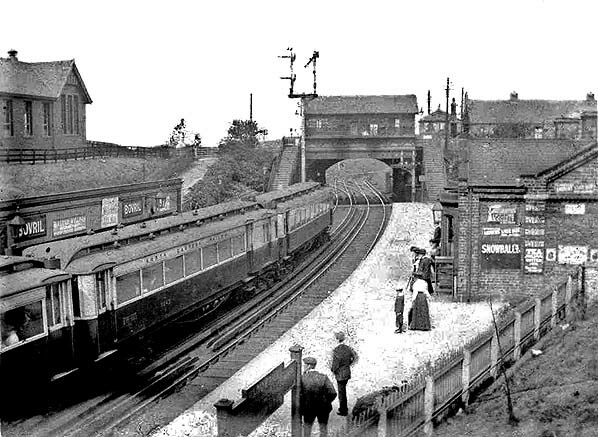 The picture was taken two years before the new Metro station (seen in the picture below) at Northumberland Park was opened. Looking north-east from Algernon Drive bridge towards the site of Backworth station in November 2009.